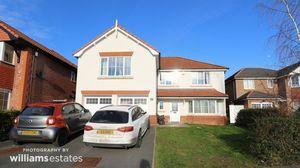 Available For Sale This superior 5 bedroom detached house was built by Anwyl Homes in 2010 set in The cathedral city of St Asaph which boasts a selection of highly regarded schools, as well as a wide range of amenities such as shops, leisure centre, parks and health facilities. Situated right by the A55, St Asaph has great links to Llandudno, Chester and Liverpool. The accommodation affords an airy, bright hallway, downstairs cloaks, dining room, lounge, large kitchen/family room, utility room and double garage. Upstairs, the galleried landing leads to five bedrooms, two with en-suites, and a family bathroom. There are well maintained gardens front and rear along with ample off road parking. As you would expect in a superior home, the property includes refinements such as uPVC double glazing, gas fired central heating with LED lighting, alarm system, solid oak internal doors and many more refinements. Only after a viewing can one appreciate the stunning location of this perfect family home. EPC Rating B81. Feature high ceilings, coved ceiling, smoke alarm, radiator, power points, thermostat control for heating, alarm pad, under stairs storage, tiled flooring and a uPVC double glazed window to the front elevation. In white comprising wash basin with tiled splash back, low flush WC, radiator and downright. A lovely family room which comprises of modern fitted wall, drawer and base units, complementary work surfaces over, illuminated display cabinets, built in stainless steel double oven and grill, matching five ring gas hob with matching splash back and extractor hood, integrated fridge and dishwasher, 1 1/2 stainless steel sink with drainer and mixer tap, power points, TV point, LED lighting, radiator, tiled floor, a uPVC double glazed window to the rear elevation and matching French doors with glass panels adjacent lead out to the rear garden. uPVC double glazed French doors and windows adjacent lead out to the rear garden which has views over the garden, attractive coved ceiling, feature fireplace with marble backing and hearth, inset gas fire, wall lighting, two radiators, power points, TV point and network points. A nice light room, coved ceiling, radiator, power points, telephone point and a uPVC double glazed bay window to the front elevation enjoying lovely views. With base unit, work surface over, stainless steel sink with drainer, plumbing for washing machine, space for tall standing fridge/freezer and tumble dryer, radiator, power points, a double glazed door with obscure glass panel leads out to the side elevation. A further door leads into the garage. A uPVC double glazed window to the front elevation which gives a nice light landing,smoke alarm, downlighting, loft access hatch with integral ladder and boarded for storage, radiator and power points. Good size with a modern fitted suite comprising double shower enclosure with fuly tiled walls, wash basin and WC set into a unit with shelving, shaver socket point, downlights, radiator and a uPVC double glazed obscure window to the side elevation. Comprising of a modern suite with shower enclosure, wash basin, low flush WC, shaver socket point, downlights, radiator and a uPVC double glazed obscure window to the rear elevation. With built in sliding mirrored wardrobes, radiator, power points, TV point and a uPVC double glazed window to the front elevation. With radiator, power points, TV point, and a uPVC double glazed window to the rear elevation. Having radiator, power points, TV point and uPVC window to the rear elevation. Comprising of a modern white suite with panelled bath, separate double shower enclosure, wash basin, low flush WC, attractive tiled walls, radiator, , shaver socket, extractor fan and uPVC double glazed obscure window to the side elevation. On approaching the property there is a tarmac double width driveway which provides ample off road parking and in turn leads to the double garage. The front garden is lawned with mature trees planted, an attractive paved pathway leads to the front accommodation. A timber gate gives access to the side being paved and housing the electric and gas meter cupboards. A further timber gate gives access into the rear. The rear garden is mainly lawned, shrubs surrounding with an attractive paved patio and bounded by fencing. An outside tap, LED down lighting and floodlighting complete this peaceful, private garden. Two remotely controlled electric doors, power, lighting, ample storage space, fuse box, wall mounted 'Worcester' boiler and a door which leads out to the side elevation.